Most solar physicists agree that the Sun's polar magnetic fields at solar minimum are the seeds to the next solar cycle. Indeed, observations have shown that the strength of the polar fields is a good indicator of the strength of the next cycle. Interestingly, the polar fields observed after the Cycle 23 maximum became about half as strong as observed for the previous two cycles. This was followed by an extended Cycle 23/24 minimum and what is proving to be the weakest solar cycle in at least a hundred years. This has caused speculation that the Sun may be entering another Maunder Minimum. With such unusual solar conditions in our midst, solar physicists are becoming more motivated to determine exactly how magnetic flux is transported to the poles and how the polar fields are modulated. Polar Field Strengths. 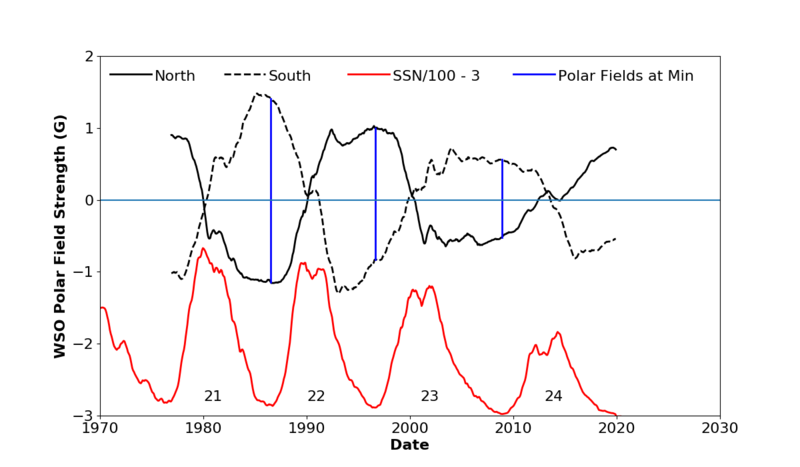 This image shows the variation in the strength of the polar fields over the last three solar cycles. Polar field strengths during the Cycle 23/24 minimum were much weaker (1/2) than for the prior two minima.